Miami Fence Company - Fences that LAST! If you’re looking into getting a fence installed, you have come to the right place. There is no better place to get a fence installed than here. We are the best place to get a fence from in the Miami-Dade area. If customization and options are important to you, you will find satisfaction here. We offer many different types of fences so you have plenty to choose from. We also have different styles and functions for gates available in the same materials as the fences. Certain styles may have different color options so be sure to inquire about that. We would be glad to walk you through the different options so you can make sure you get exactly what you want for your property. The process of getting your fence installed is simple. We will survey your property, work with you to determine the best type of fence and gates are best for your needs, and then our team of professionals will install your fence. Once the fence is installed, feel free to let us know if you need any changes to be made. We want your fence to be perfect and live up to your exact expectations. We promise to install your fence and gates with care and precision from the start. Our fences are built to last. 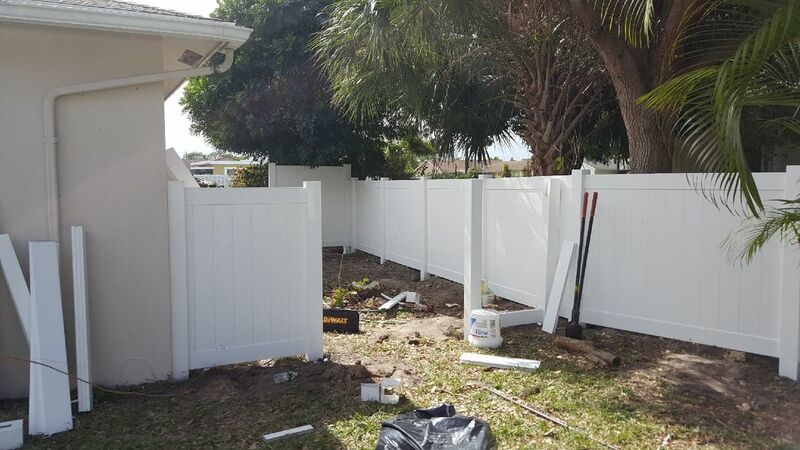 We know that Florida experiences many types of weathering like erosion and water damage so we make our fences from the highest quality material. Our wooden fences are built to withstand strong winds from hurricanes and storms, water damage from the humidity and rain, and dry rot from the blazing sun, our metal fences are made to withstand rust, and our plastic fences are built to withstand the burning Florida heat. We use these materials to ensure that your fence will last a long time before ever needing to be replaced. If you are faced with the situation where your fence or gate needs to be fixed or replaced, do not hesitate to contact us. We are available full-time to respond to your needs. Our team of professionals would be more than happy to assist you in getting your fence back to normal as if it were brand new. We understand that Miami is prone to storms and with storms often come property damage, and we understand that accidents can happen with pets, children, lawn equipment, and other forces. The most important thing to us is that your fence functions as you need it and that you as a customer are happy. Our priority is making sure that you have everything you need. We want you to feel like part of our family and we want to keep you taken care of. If you are ever unsatisfied with your fence, gate, installation, or other service, please let us know so we can make any adjustments. Our team of professionals is dedicated to going above and beyond what is expected so that you can always feel like you are getting the service you deserve.